“Infrared light would be an excellent means of interstellar communication,” said Shelley Wright, an Assistant Professor of Physics at the University of California, San Diego who led the development of the new instrument while at the University of Toronto’s Dunlap Institute for Astronomy & Astrophysics. Pulses from a powerful infrared laser could outshine a star, if only for a billionth of a second. Interstellar gas and dust is almost transparent to near infrared, so these signals can be seen from greater distances. It also takes less energy to send the same amount of information using infrared signals than it would with visible light. The idea dates back decades, Wright pointed out. Charles Townes, the late UC Berkeley scientist whose contributions to the development of lasers led to a Nobel Prize, suggested the idea in a paper published in 1961. Scientists have searched the heavens for radio signals for more than 50 years and expanded their search to the optical realm more than a decade ago. But instruments capable of capturing pulses of infrared light have only recently become available. Shelley Wright holds a fiber tht emits infrared light for calibration of the detectors. Three years ago while at the Dunlap Institute, Wright purchased newly available detectors and tested them to see if they worked well enough to deploy to a telescope. She found that they did. Jérome Maire, a Fellow at the Dunlap, “turned the screws,” Wright said, playing a key role in the hands-on effort to develop the new instrument, called NIROSETI for near-infrared optical SETI. NIROSETI will also gather more information than previous optical detectors by recording levels of light over time so that patterns can be analyzed to for potential signs of other civilizations, a record that could be revisited as new ideas about what signals extraterrestrials might send emerge. Because infrared light penetrates farther through gas and dust than visible light, this new search will extend to stars thousands rather than merely hundreds of light years away. And the success of the Kepler Mission, which has found habitable planets orbiting stars both like and unlike our own, has prompted the new search to look for signals from a wider variety of stars. 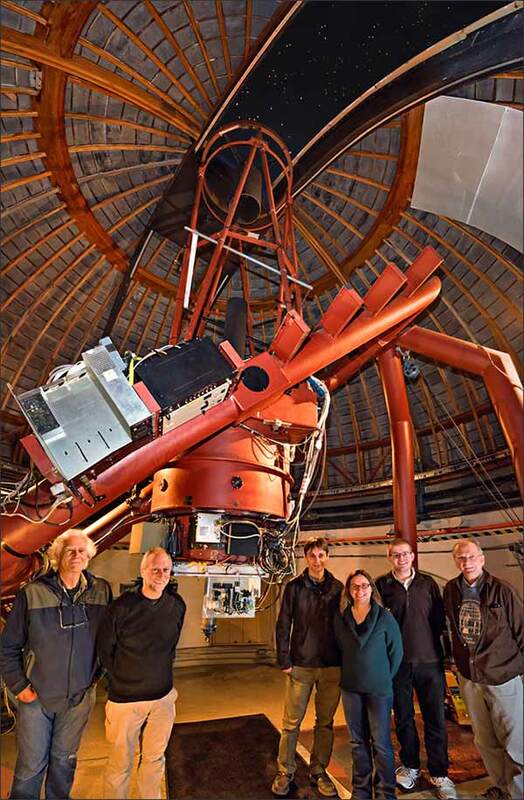 NIROSETI has been installed at the University of California’s Lick Observatory on Mt. Hamilton east of San Jose and saw first light on March 15. 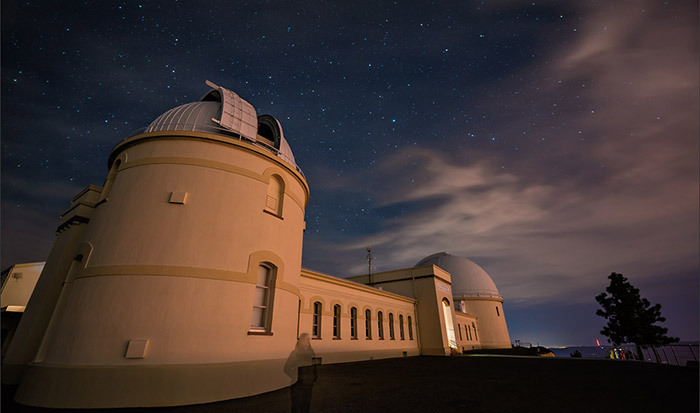 Skies cleared for a successful first night for NIROSETI at Lick Observatory. The ghost image is Shelley Wright, pausing for a moment during this long exposure as the rest of her team continued to test the new instrument inside the dome. Lick Observatory has been the site of several previous SETI searches including an instrument to look in the optical realm, which Wright built as an undergraduate student at UC Santa Cruz under the direction of Remington Stone, the director of operations at Lick at that time. Dan Werthimer* and Richard Treffers of UC Berkeley designed that first optical instrument. All three are playing critical roles in the new search. Patrick Dorval, Jérome Maire and Shelley Wright in the control room of the Nickel 1-meter telescope at Lick Observatory, where their new instrument has been deployed. The NIROSETI team also includes Geoffrey Marcy and Andrew Siemion from UC Berkeley; Patrick Dorval, a Dunlap undergraduate, and Elliot Meyer, a Dunlap graduate student. Shelley Wright is also a member of the Center for Astrophysics and Space Sciences at UC San Diego. Richard Treffers is now at Starman Systems. Funding for the project comes from the generous support of Bill and Susan Bloomfield. [The owner of this blog is a small financial supporter of UCO Lick, SETI Institute, UC Santa Cruz where UCO is managed, and SETI@home, which caused him to spend an inordinate amount of time on this post. I hope it gets read by a lot of people. *Dan Werthimer is co-founder and chief scientist of the SETI@home project and directs other UC Berkeley SETI searches at radio, infrared and visible wavelengths, including the Search for Extra-Terrestrial Radio Emissions from Nearby Developed Intelligent Populations (SERENDIP). He is also the principal investigator for the worldwide Collaboration for Astronomy Signal Processing and Electronics Research (CASPER). SETI@home runs on software developed by BOINC at UC Berkeley.